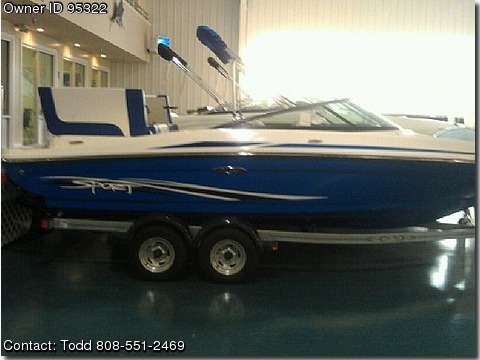 Contact the owner Todd @ 808-551-2469 or toddgill13@yahoo.com.2012 205 SeaRay Sport. Fully loaded, this boat was 57,000. I bought it off the showroom floor four months ago for 40,000. This boat has all the amenities a SeaRay is famous for. Also comes with a 2013 Trailer, complete cover, and full coast guard ready for 10. She seats 10 comfortably and tops out at 57mph. 4.3 MerCruiser with less than four hours. A brochure and the actual purchase sticker can be emailed to you as well as pictures. If you goggle this model you will have an idea of the basics, but many upgrades are included. I recently found out that I will be moving to Europe on 31 July. I won't take a loss, but looking for someone who knows a good deal. I purchased the extended warranty and service. I purchased the boat from Treasure island marina and they are very helpful with anything you may need to include coast guard safety courses and general maintenance help or questions.